Have you discovered the super powers of tea? But tea also gives you a chance to cultivate mindful presence with whatever you are engaged with. 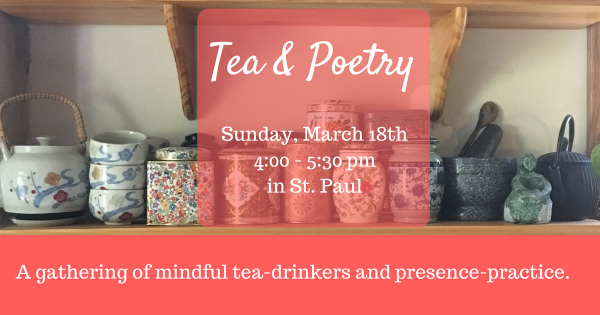 We will gather, with tea, to turn our mindful and gentle gaze to poetry. Read, listen to, and savor the singular beauty of each poem, while engaging in a mindfulness process inspired by the sacred practice of lectio divina. Share tea, a gluten- and dairy-free treat*, and poetry—all in presence-full company. Bring poems to share related in some way to the Spring theme of awakening. * Real-food and low added sugar, too! Hi Katy, can’t make it this weekend, but sounds like a v nice gathering! Thank you for thinking of me. Too bad, Cynthia! Would have been fun to share this with you!